Wouldn’t you like to wake up every morning knowing that you’re doing your part to preserve important bird habitat? We think it’s such an important choice that we’ve organized a Golden Gate Audubon Coffee Club to make buying and enjoying the right bird-friendly coffee a breeze. 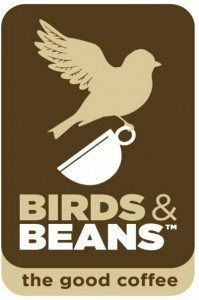 And if you’re not already drinking shade-grown organic coffee, you’ll be thrilled by the rich, clean flavor of Birds & Beans coffees. Birds & Beans coffees are certified as bird-friendly by the Smithsonian Migratory Bird Center. Birds & Beans is offering a great incentive by waiving the shipping charges for GGAS Coffee Club members. Golden Gate Audubon is not charging any markup on these orders—you are getting the coffee at cost. Take a look at the options below and join the club today. See the instructions below to send an email with your selections or complete this PDF and then email or FAX the form. Note: All orders are shipped whole bean unless specified. Ground coffee options include: Coarse, Extra Fine (Kingbird Espresso Only), Fine, or Medium grind. Espresso coffee option: Extra Fine. There is no additional charge for grinding. Place your order and mail your check (made out to Birds and Beans Coffee) to Erica by the last day of the month for delivery during the third week of the following month. Pick up your coffee either at the Speaker Series in Berkeley (every other month), Oakland location or at the GGAS office. Let Erica know if you want your orders to be renewed on a recurring monthly basis. Contact Erica to make alternate payment arrangements such as e-check for recurring monthly orders. Erica will email all coffee club members upon delivery. GGAS office hours for coffee pick-up are Monday, Wednesday and Thursday, 9 am to noon and other times by appointment. The address is 2530 San Pablo Avenue, Suite G (at Blake) in Berkeley, phone: (510) 843-2222. Many of the warbler, oriole, and flycatcher species that we love winter in the tropics and depend on forest habitat. There aren’t laws that regulate which coffee can be labeled as shade-grown. Without careful shopping, your good intentions might be for naught. Next to tobacco, conventionally grown (non-organic) coffee is sprayed with more chemicals than any other product consumed by humans. Coffee-producing countries have some of the highest numbers of threatened bird species due to deforestation and loss of habitat. Coffee is the largest US food import. Some 2.25 billion cups of coffee are consumed in the world daily.